Today, in Jeppestown, a once booming gold rush city, many of the vacated homes have been purchased by enterprising landlords and renovated to house as many families as possible—searching for higher profits and disregarding health and sanitation. Though less than ideal, the homes are a welcome refuge to immigrants who would otherwise live on the street. Making an average of $70 per month, these families survive by any means necessary in hopes of finding a life better than the one they left behind. Although Jeppestown residents live in a community of poverty and conflict—battling xenophobia, HIV, high crime—the region is still a community full of hope, vibrance and life. In this series of prints, I hope to convey the remaining spirit and vitality of Jeppestown—the details of daily life that are overlooked; what made Jeppestown special to me. The joy, the fun and the spark that his community still holds. 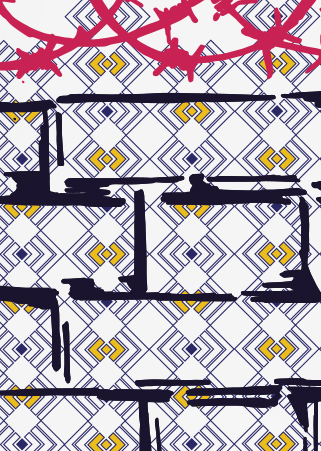 Additionally, because my work with the Kgosi Neighborhood Foundation’s sewing initiative was one of the most significant things I did this past summer, I want to infuse each print with inspirations from traditional South African prints and fabrics. I wanted the gorgeous and detailed patterns, works of art on their own, to add and enrich the quality of my work. I also wanted to portray through the pattern the many people that compromise all the individual elements—that come together to make something beautiful. As a collection, I want all these pieces to come together to be cohesive and a personal expression and reminder of the world I lived in and became so close to—a community that needs to be share and loved.